So many doubted the feasibility of a transparent crowdfunding or online fundraising platform in Nigeria with the possiblity to deliver at per with world class crowdfunding portals, this birth donateng..
donate-ng set out on a journey a little over a year, with the hope to bridge the gap between Charity organisation, Charitable causes/campaign and individuals (donors) with the heart and will to support the causes raised in Nigeria by Nigerians – We knew this was possible through Crowdfunding and online donations using modern day online payment solutions. The donate-ng team dreamt of lending a voice to the sick who needed money for treatment. We longed to help build/rehabilitate schools, provide clean water, build places of worship and empower those who are hitherto powerless; bearing in mind that we all draw our strengths from each other and knowing that I am who I am because of who we all are. We make bold to say; we are Nigeria’s go-to crowdfunding platform. We do not mean this in a braggadocios way, in fact this is not our words but an expression of the numerous people whom we have had the privilege to have helped raised funds for their charity and charitable causes on our platform. those who dont like to have to go directly to the bank. daunting task. I can confirm that it wasn’t with donate-ng.com. “We saw a need, Nigerians dying in IDPs camps and our humanity went to work immediately but here lies a challenge; how do we get Nigerians to donate to a cause believing their money will be used for the intended purpose. We thought a reliable platform that is easy to use and trusted to deliver would be great. We started searching and came across donate-ng. I went through the enrollment process and needed to provide referees for second level verification. Not long after I made submission, donate-ng went to work and in less than few hours the #SaveBornoIDPs citizen-led campaign was up on their platform. donate-ng customer service is excellent. Their promise can be taken to bank without disappointment. Even on weekends, they supported us all through. They deployed several means of payment making donation easy for people and rose to the challenge of engaging potential donors who may be experiencing challenges. donate-ng rendered the #SaveBornoIDPs Citizen-led initiative one of the most transparent campaign I have ever been involved in. The platform allows you to see amounts donated and number of donors, for those who want to remain anonymous donors, it also allowed it. When it was time to take delivery of funds that have been raised, there was no story. They rendered the account clearly and every kobo was accounted for. I believe the #SaveBornoIDPs Citizen-led campaign was successful in part because we got a trusted and donor-friendly platform in donate-ng. 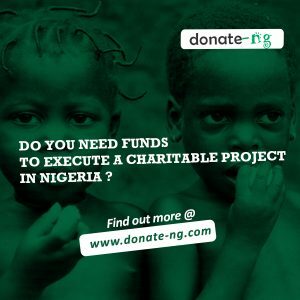 Of all the experience you get with donate-ng, one stands out and is synonymous with all that have worked with; they all achieved their aim of changing lives. Crowdfunding: A viable option for NGOs in Nigeria?